TORONTO, April 19, 2018 – Woodbine’s 2018 Thoroughbred season will kick off in just two days! Join us as we catch up with some of our top jockeys before Opening Day this Saturday, April 21. Ranking no worse than second in the Woodbine jockey standings for the past seven years, Luis Contreras again secured the runner-up honours in 2017 with his mounts winning 170 races, including 17 stakes, and more than $7 million in purse money. 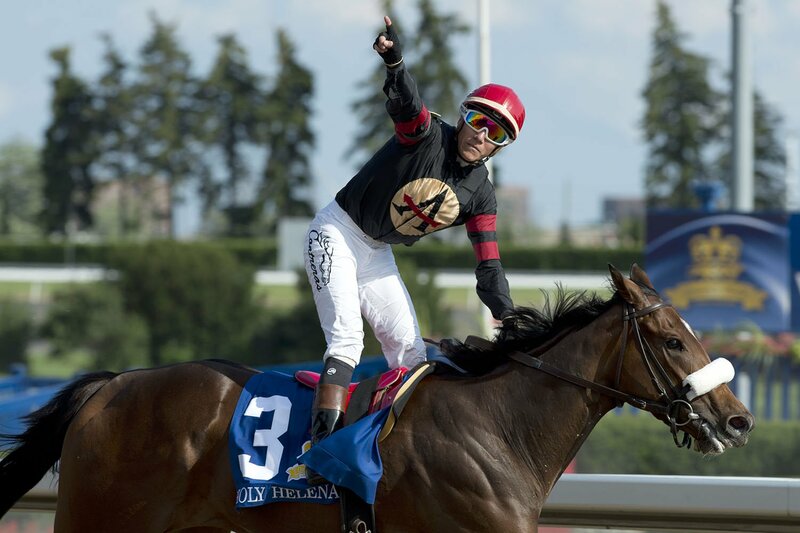 Contreras swept the Woodbine Oaks and $1 million Queen’s Plate for the second time in his career with Stronach Stables’ filly Holy Helena, who was the leading money-winning horse of the meet for trainer James Jerkens. Contreras pulled off a Grade 1 upset victory in the $300,000 Northern Dancer with the Ashlee Brnjas-trained Johnny Bear, who also gave him a Canadian Millions Day score in the Halton Stakes. His other graded stakes winners were Field of Courage (Grade 2 Nearctic) and Ami’s Mesa (Grade 3 Ontario Matron & Grade 3 Seaway). Inflexibility was another two-time stakes winner for Contreras as she won the $225,000 Wonder Where in addition to the Carotene. How did you spend your winter? I spent my winter riding in Arkansas at Oaklawn Park. What are you most looking forward to about the Woodbine meet? It’s exciting to go back home and ride there for the fans. Do you have any goals for the meet? Yeah, definitely. One of my goals every year try to be a leading jockey again. How do you prepare for the meet? I’m doing different things to prepare. I’m just riding and I’m exercising in the gym now. I’m just preparing a little bit more than before. If you could relive one race from the 2017 season, which would it be and why? It would be the Queen’s Plate, definitely. It’s everything to win that race: it’s the horse I rode that year and I won the race and it’s a big day with a lot of people at the track. It’s everything together. Everything makes the day a little more special. What do you love most about being a jockey? To be on the horse! How did you fall in love with horse racing? I grew up with all my family being there. I remember going to the track with my father when I was young and I always loved to be around horses. This entry was posted in Woodbine Insider and tagged Horse Racing, Luis Contreras, Opening Day, Queen's Plate, Woodbine. Bookmark the permalink.